Graduate students and researchers in epidemiology and molecular biology, cancer researchers, and medical residents. General Principles: A Conceptual and Historical Framework for Molecular Epidemiology, P.A. Schulte. 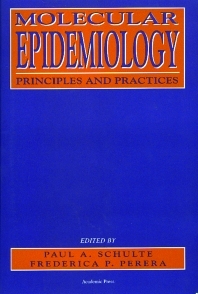 Molecular Biology in Epidemiology, R. Hurst and J.Y. Rao. Validation, P.A. Schulte and F.P. Perera. Technical Variability in Laboratory Data, P. Vineis, P.A. Schulte, R.F. Vogt, Jr.. Biological Monitoring and Pharmacokinetics Modeling for the Assessment of Exposure, P.O. Droz. Design Considerations in Molecular Epidemiology, P.A. Schulte, N. Rothman, and D. Schottenfeld. Statistical Issues and Procedures, V.S. Hertzberg and E. Russek-Cohen. Biological Specimen Banks: A Resource for Molecular Epidemiologic Studies, D.M. Winn and E.W. Gunter. Interpretation and Communication of Results, P.A. Schulte. Use of Biomarkers in Risk Assessment. Practical Applications, D. Hattis and K. Silver. Practical Applications: Carcinogenesis, F.P. Perera and R. Santella. Infectious Disease, L.H. Harrison and D.E. Griffin. Cardiovascular Disease, P.A. Schulte, N. Rothman, and M.A. Austin. Genetic Disease, M.J. Khoury and J.S. Dorman. Biologic Markers in the Epidemiology of Reproduction, G.K. Lemasters and P.A. Schulte. Immune Markers in Epidemiologic Field Studies, R.F. Vogt, Jr. and P.A. Schulte. Biomarkers of Pulmonary Disease, M.S. Tockman, P.K. Gupta, N.J. Pressman and J.L. Mulshine. Pulmonary Disease. Biologic Markers in the Genitourinary System, G.P. Hemstreet, III, R.E. Hurst and N.R. Asal. Neurologic Disease, J.D. Griffith and V.F. Garry. Practical Applications of Biomarkers in the Study of Environmental Liver Disease, C.H. Tamburro and J.L. Wong. Biomarkers of Musculoskeletal Disease, J.P. Mastin, G.M. Henningsen, and L.J. Fine. Epilogue, N. Rothman. Index. Dr. Schulte is an epidemiologist with interests in education, quantitative risk assessment, health communication, use of biological markers in epidemiologic research, intervention research, and genetics. In recent years, he has conducted extensive research on occupational cancer. He has focused on issues of dissemination of occupational safety and health information. Dr. Schulte is the editor of the textbook entitled, “Molecular Epidemiology: Principles and Practices.” He has served as guest editor of the Journal of Occupational Medicine and the American Journal of Industrial Medicine and was on the initial editorial board of Cancer Epidemiology, Biomarkers and Prevention. He also has served as a consultant to various organizations such as the International Agency for Research on Cancer, the National Academy of Sciences, the Medical Research Council of the United Kingdom, WHO, the Pennsylvania Department of Health, the Agency for Toxic Substances and Disease Registry, and the Department of Energy. National Institute for Occupational Safety and Health, Robert A. Taft Laboratories, Cincinnati, Ohio, U.S.A.